The consent of the belligerent governments and the pertinent diplomatic guarantees, the establishment of relief organizations inside and outside the occupied territories, the determination of imports required---all constituted essential preliminaries to the relief of Belgium and Northern France. But they produced no food. Food costs money to buy and transport, and as some nine million people had to be fed, a great deal of money had to be found. Each succeeding year more money was required as the need of imports grew and the cost of commodities and transport mounted to more and more forbidding levels. The original undertaking was conceived as a charitable operation based on donations in kind and money throughout the world plus such slender resources as could be gathered through the balances of Belgian banks abroad. Within a very short time, however, Hoover recognized that the task was greater than such a precarious income would support. (70) He began, therefore, to press for government support from both the German and the Entente Governments, basing his demands upon their responsibility on the one side for the occupation and on the other for the blockade. This campaign for government support, begun in November 1914, he pushed continuously thereafter, first in one direction, then in another and frequently in several at once until after the United States entered the war and the question of Allied finance became less acute. In the meantime various plans were developed by which some resources were obtained. Exchange operations which resulted in actual relief were carried out to a limited extent by the C.R.B. At its various offices abroad the Commission received sums of money to be remitted to Belgium. These sums were, in effect, invested in food which was sold on ration cards to persons in Belgium who could afford to buy and the war paper currency thus received was made over to the persons designated by the remitter. (71) The worldwide campaign for gifts was continued, but resources at no time from any direction were sufficient to provide for the whole of necessities. Even after the British and French Governments agreed to furnish subsidies, the inadequacy of finance was an ever-present trouble, for the Commission had to compete for funds as for supplies and ships with departments of war administrations whose demands, surpassing the most extravagant forecasts, devoured the resources which the national treasuries found it increasingly difficult to provide. In spite of temporary failures and tense hours when the spectre of insolvency hovered darkly over the whole enterprise, the funds were secured and the flow of food into the occupied territories did not fail. The negotiations that prevented failure were, as the documents show, of a peculiarly strenuous and informal character. The circuitous methods of diplomacy were dropped. Hoover, as an unofficial but. none the less real representative of nine million French and Belgians, labored directly and personally with the highest officials of the belligerent powers, and he did not stop laboring until he had secured the vital funds. How important these loans or subsidies were is apparent when it is realized that they constituted over 78 per cent of the total of almost $900,000,000 mobilized by the Commission. Gifts were large(72)---unprecedented in the history of philanthropy---and they were extremely important contributions to the success of the enterprise, not only for the charitable aid to the destitute which they made possible but also for the wide public support of the work which these gifts indicated. The amounts of subsidies which are the subject of this chapter are shown in the table on the following page. The sums referred to here and in the following documents as "subsidies" were advanced by the British, French, and after April 1917 by the United States Treasuries to the C.R.B. as loans to Belgium and to France. In after-war settlements the Commission accounted(73) for the stewardship of these funds to Belgium and France. It was, of course, neither concerned with the question of reparation to these countries for the occupation years nor officially involved in inter-government debt settlements which included these loans for relief. It is interesting to know, however, that through these debt settlements a considerable percentage of these loans was, in effect, canceled. The principal agreements are included in a later chapter(74) but may be briefly summarized here. a. The distribution between the British and French Treasuries of these subsidies for Belgian account is unofficial and subject to adjustment between these two treasuries. Belgium was relieved of its pre-Armistice war debt to Great Britain, France, and the United States by the Treaty of Versailles. (75) French and British advances to the C.R.B. for Belgian relief were thus imposed on Germany as well as the pre-Armistice portion (about 60 per cent) of the United States Treasury subsidies for the same purpose. In its direct settlement with Belgium the United States agreed to funding terms of the full Belgian debt which conceded an amount(76) greater than the United States Treasury advances to the C.R.B. for Belgian relief. The sums advanced to the C.R.B. as loans to France are insignificant compared to her total borrowings from Great Britain and the United States during the war period. The French-British and French-American debt settlement(77) agreements were signed in 1926, but at this date---1928---neither has been ratified by the French Chamber of Deputies. Hoover's proposals that the British Government grant a monthly subsidy for relief and permit the Commission to engage in exchange operations met with a far from encouraging reception. The opinion, already mentioned, that the relief of Belgium was an indirect benefit to Germany carried much weight at this time, and the Government was unwilling to sanction new measures which would make this indirect aid more extensive. To overcome this opinion the Commission had to get new guarantees from the Germans, while Hoover continued energetically to press the case with British officials. Hoover presented the needs of the Belgian civil population and handed Sir Edward Grey the memorandum attached. Sir Edward undertook to discuss the application with his colleagues but stated that the continued requisition of native food by the Germans made it very difficult for the British to take a favorable view of themselves contributing money, as this was in effect supplying food to the German Army. Hoover undertook to make representations to the German Government in this matter and Sir Edward stated that success on this line would certainly greatly influence his views. He informed us that the Government had in any event granted us £100,000, which would be paid through the Belgian Minister. In the latter part of October a committee was created in Brussels called the National Relief Committee, composed of leading residents and local officials, with a view to dealing with the whole of the famine conditions which faced the Belgian people. These gentlemen appealed to the American and Spanish Ambassadors and Ministers for protection for the foodstuffs secured by them. This matter was negotiated by the representatives of these Governments in London, Brussels, The Hague, and Washington, and an undertaking was arrived at whereby the foodstuffs imported under these Ambassadors and Ministers should be free from molestation. In order to provide a body who could carry into execution the very considerable labor involved in securing and handling this food various representatives of the Spanish and American Governments have created a Commission, of which I have the honor to be Chairman. We have in turn established offices in London, Rotterdam, and at necessary points throughout Belgium, where warehouses under our protection are being established and the foodstuffs which come to our hands are placed in these warehouses under our protection, and are dealt out to the National Committee and its branches for detailed distribution. The first was the protection of these foodstuffs in Belgium. Thirdly, the stimulation of philanthropic effort. The situation appeared to us so critical that we have devoted all the energy we are capable of to securing some immediate relief, and although we have had our organization in existence scarcely ten days, we have nevertheless delivered some 4,500 tons of food into Belgium, we have some 10,000 tons which will be delivered within another ten days, and we have something like 25,000 tons in sight in various quarters of the world. One of our first problems was, however, to determine as accurately as possible the volume of the problem with which we had to deal. An inquiry was undertaken by the members of this Commission with the assistance of the National Committee, its local branches, and the Belgian local officials, and I have with me a statement prepared by Mr. Francqui, working head of the Belgian National Committee. This statement shows that the problem does not consist merely of supplying food to the more unfortunate and unemployed members of the community, but resolves itself into the provisioning of the entire nation of some 6 million to 7 million people. Food must be furnished to the rich as well as to the poor. There are some meat and vegetable provisions still in Belgium, but there is practical exhaustion of cereals, and these gentlemen estimate that the absolute monthly minimum on which this population can be kept alive is 80,000 tons of cereals. (79) That this is no exaggeration is evidenced by the fact that the normal production and net imports of cereals into Belgium are between 275,000 and 300,000 tons per month, and the calculation of 80,000 tons is based on a ration of approximately 10 ounces per capita per diem. Desirous that there should be no error in our statements as to the minimum requirements of this people, we asked the American Minister in Brussels himself to check the data upon which these estimates are based, and I have here a statement from him and the Spanish Minister, corroborating the estimate which has been given to us. I have also a large amount of data as to the actual pressing position, estimates as to the future necessities, from various authorities throughout Belgium, the details of which I will not go into. This minimum of monthly requirement of 80,000 tons will involve an expenditure of between £800,000 and £1,000,000 per month, and this expenditure will be necessary over the next eight months at least. A substantial proportion of this food will be resold by the Central Committee and its branches, but we have yet to solve the problem of how the credit documents which may be secured can be converted into cash. We are hopeful that we shall be able to recover from 30 per cent to 50 per cent in a form which we can monthly liquidate and revolve into further purchases. This problem therefore becomes so large as to be far beyond solution by charitable and philanthropic effort. It is one of those problems which can only be solved by a substantial substratum of government guarantee, and this substratum must at least amount to from £400,000 to £500,000 a month. We have inaugurated and carried on in neutral countries a vigorous publicity on behalf of the Commission, with a view to stimulating as far as possible the sympathies and help of the good people of America, Australia, Spain, Canada, and elsewhere. We have had the most gratifying response, and I do not think we exaggerate if we say that we have in prospect at present twenty cargoes of foodstuffs. You will realize, however, that in the present financial situation throughout the world the collection of money for these purposes is extremely difficult, and when I inform you that the Belgian National Relief Committee in the United States has been unable out of its resources to give us an appropriation of £30,000, you may be able to appreciate how limited are resources of this character. On the other hand, the generous people, especially of the Western United States and Canada, and other countries are prepared to subscribe generously actual foodstuffs from their own stores, and, in order to take advantage of this, our immediate problem is to find the resources to transport these foodstuffs to the Belgian people. Roughly, £1 spent in transportation will bring £4 to £5 worth of foodstuffs into Belgium, and if we could say to all of these people that this Commission has been placed in position to undertake and pay for this transportation cost, I am sure that we would doubly stimulate their contributions. I should like in fact to be able to telegraph at once tonight to twenty centers in the United States and Canada which are at work on this problem that we have the finance put at our disposal whereby we can undertake this entire transportation. I would like to suggest that despite the great strain the English people are under, this service of transport is one which the English people might seriously consider. The provision for us of a subvention of say £150,000 a month would enable us to undertake this work with assurance and would help to fill in such gaps as are bound to occur in the necessarily irregular flow of charity. As in all philanthropic efforts the first flow no doubt will be large, but we have to face a fact that as months go by, a larger and larger proportion of this problem will fall upon the actual purchase of food, and if we are to provide for these people with a constant and regular flow, it is necessary for us to be assured that we will have financial strength with which to carry the business on systematically. We should be placed in a position at once to charter ships for periods of months and to take commitments entirely beyond those which we can take out of occasional and irregular cash subventions. Aside from a subvention of £150,000 a month from the English Government we have a feeling that in all of the circumstances the French people owe something to the civil population of Belgium and that they should also meet us with a similar contribution. We have promised to us a liberal contribution from the Rockefeller Foundation, and this would go much farther if we could relieve that institution of the load of transportation. The active members of this Commission are composed altogether of energetic and business people, and they are prepared to devote their time and pay their own expenses in this work. The work of the Commission will be carried on at comparatively small expenditure and we have already received from our own sources such funds and have made such provisions that no organization expenditure will fall upon any contribution which is made to us. Every penny which we receive will be devoted to one purpose of securing foodstuffs and their transportation and absolute delivery into the hands of the community in Belgium. With regard to the petition which. we had the honor to make to you on the 5th of November for financial assistance from the British Government toward this work of the Commission, I trust you will forgive me if I revert to the subject. Although at that time I felt we were all deeply impressed with the necessities of the civil population of Belgium, every event which has happened since has gone to reinforce the fact that the gravity of the situation was even deeper than was then outlined by us. We have made some progress in the direction of the obtaining of funds, but they are wholly and absolutely inadequate to our requirements. We have a fund secured to us by guarantees by certain members of the Belgian Committee and private gentlemen in Brussels to the extent of £600,000, from which we are able to undertake the free transportation of gift food from any part of the world. The advertisement of this fund has brought to us most satisfactory returns by way of assurances of the collection of food from agencies which we have established, more particularly in Canada and in the United States. The flow of charity is nevertheless at best most irregular and unreliable, whereas the necessities of the population of Belgium are a fixed daily volume, and we are therefore compelled to purchase considerable quantities of food supplies to supplement the gifts which are made to us. We have had a number of conferences with the representatives of the Rockefeller Foundation (who have come to Europe at the inspiration of the American Ambassador to seriously consider the application of the reserves of that Foundation at least in part to our problem), and the suggestion has been made by these commissioners to the Foundation that a subvention of £100,000 per month from the Foundation might be made conditional upon our securing on this side subventions amounting to £200,000 per month, that Institution considering that this minimum sum must be provided by way of guaranteed income. Some effort is being made by the Belgian Government but it is largely directed to the provision of working-capital with which we may purchase foodstuffs for resale in Belgium, which is, in effect, serving only that portion of the population who are yet possessed of reserves. All of us who have spent many years in England realize the heavy load which the English people have to carry and, confident as we are of the eventual outcome, our feeling is that advances made by the British Government would be undoubtedly recovered in the final clean-up. Mr. Frederick Palmer, whom we look upon as the most statesmanlike of the American newspaper correspondents, recently visited Germany and at our request endeavored to formulate some opinion as to the attitude of the Germans to the question of the feeding of the Belgians, and I send you herewith a copy of the statement which he has handed to us. I have the honor to be, etc. HOOVER TO PAGE, concerning discussions with the Belgian Government relative to advances which the C.R.B. would disburse to pensioners of the Government within Belgium in local currency, thus effecting exchange through the C.R.B. He thinks that if we could arrange to pay these pensions with the money which we collect for the sale of food in Belgium, the Belgian Government could furnish us with a like sum in English money at this end. This would, so far as our work is concerned, be equivalent to a subsidy of something over £400,000 a month. In other words, this is another way of effecting exchange out of Belgium. I am proposing to take this matter up for discussion with Mr. Whitlock, with a view to getting the approval of the German military authorities in Belgium to these payments, as I cannot see why there should be any military objection to its being done. Furthermore, in advancement of my original idea that the communes should give us some obligation for the foodstuffs furnished to them and that they should in turn resell these foodstuffs to the population, I gather from him that there may be a possibility that the Belgian Government would agree to take up these communal obligations here in London and then we could convert them into cash. All of this is another way of accomplishing what I have thought of effecting by way of a relief bank, and is much more facile, as we thus have a market for our obligations without asking public help. The matter which troubles the Belgian Minister, however, is whether or not the Germans would not take advantage of this situation to make more demands for cash upon the population, which would in fact be equal to impressing our food. In other words, if we furnished a million francs worth of food to a Belgian commune, and accepted their obligations for it, and they in turn sold a portion of this food to the people and used the money to carry on their communal government, the Belgians are afraid that the commune might be assessed a cash requisition. Although subject to your opinion, I propose to first take this up in Brussels with the German authorities through Mr. Whitlock, it seems to me that it is a matter of such vital importance that if we can arrive at a working arrangement in Brussels, possibly our Government in Washington might confirm it with the German Government, in order that the Belgian and English Governments might feel sufficiently assured in this matter. It is my impression that we should come nearer getting the help of Washington if we had made a preliminary agreement. In any event, I would be glad to have your advice. The sympathetic attitude of the German Government toward the efforts of the American people to provision the civil population of Belgium leads me to again transgress your attention to the desirability of the German Government entering into this wide humanitarian movement by a direct contribution to our fund. The minimum required amounts to fully twenty million marks per month, and any criticism leveled at the Germans for lack of sympathy to the poor of Belgium would be immediately silenced if they made a contribution of five million marks per month; furthermore, the English and French Governments would be forced to act likewise in order to support their contentions. While the American people are responding wonderfully and generously to our appeal, the flow of charity can never supply the demand and such support can from the nature of things be only temporary. "I have discussed the whole question of the advances from the Belgian Government to the Comité de Secours through the medium of the Commission for Relief in Belgium, which moneys are to be advanced by the Comité de Secours to the communal authorities in Belgium. "The German authorities inform me that they have not the slightest objection to the plan, that it receives their complete support, and that its general and detailed execution will meet with no interference with them. 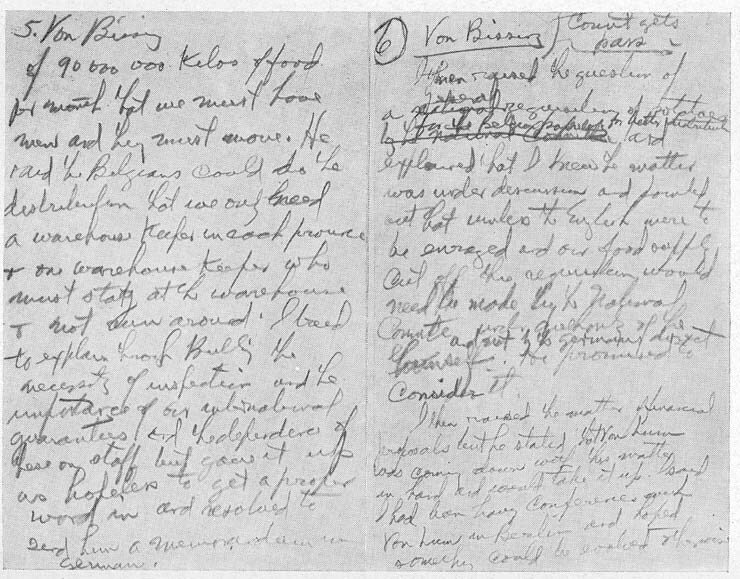 "While it would be possible for me to confirm this in writing with the Germans such a procedure would not serve the slightest use and you may take it that they are only too anxious for us to succeed in our task, and any assurance which it is necessary for you to give to the British or Belgian Government in this matter can be given by you either in your own name or in mine with the utmost confidence." WHITLOCK TO PAGE, giving assurances of the German Government's approval of the use of Belgian Government funds as proposed by the C.R.B. I have discussed with the German military authorities here the question of the status of the funds which the Belgian Government proposes to place at the disposition of the Commission for Relief in Belgium to enable the Comité National de Secours et d'Alimentation to advance to the communes the moneys with which to buy food. I am glad to be able to inform you that the German authorities have given me their assurance that they have not the slightest objection to the arrangement, that it has their entire support, that they will respect it in every particular, and that in its execution it will meet with no interference whatever from them. I can, of course, have this assurance formally confirmed in writing if you desire, though my own notion is that that would be purely a work of supererogation. The German authorities are as anxious as anyone that we succeed in our undertaking and the documents can be easily procured if you desire them. I am entirely satisfied, however, that all is in order that all will go well. Any assurances that you find it necessary to give to the Belgian or to the British Government may be given in all confidence either in your name or in mine. I am sending you herewith this week's report of the Commission. Reduced to concrete figures this document means that we have a food supply engaged, either by gift or by purchase, sufficient to carry us until the middle of April, and we are in round numbers about £1,000,000 short of being able to pay for such portions of this material as we have to buy. In a general way, it costs us about £1,200,000 a month to provide the minimum which we are endeavoring to reach, and of this about £600,000 is sold to that portion of the population which can raise the money to pay for food. About £400,000 is a dead loss, through the support of the free canteens. The latter sum has got to be secured from the charity of the world; and in this matter a subsidy of £100,000 monthly from the Rockefeller Foundation and such fortuitous amounts in gift food or money as come our way is all we have to rely upon. As to the provisioning of the more well-to-do part of the population, this is in reality an exchange problem. We import the food into Belgium and we sell it. We get the money in Belgian National Bank notes, which gravitate into our bank account in Brussels. The difficulty of getting it out is threefold. In the first place if we exported this money in actual bank notes we should denude the country of the small amount of circulating medium which has been left; secondly, if we had the Belgian National Bank notes in London they would not be realizable in gold; and, thirdly, the Germans will not allow us to bring them out. Therefore we are driven to find some employment for effecting exchange. There are certain Belgian bank balances and their credits scattered over the world which we could possibly arrange to have turned over to us, we in turn paying these institutions in Brussels out of the moneys which we have to our credit there from food sales. I do not know how far this liberty of action would save our situation, but I fear that it would not be anything like complete. I cannot see from an English Government point of view that there should be any objection to our doing exchange business where we can obtain it, because we are not introducing gold into Belgium nor abstracting gold from England any more than is abstracted in the normal purchase of foodstuffs from abroad. The people to whom we would make payments in Belgium would be entirely Belgians or Belgian institutions. Aside from this method, however, which is fortuitous, it appears to us that we have got to have some support implemented by governments. If we could make payments in Brussels on account of the Belgians, to support the communal governments or other organs of the Belgian Government, and if the Belgian Government in turn could borrow money from the Allies and hand it to us, this would completely solve the question and the amount involved would be £300,000 a month, less direct exchange for private individuals that we might be able to do. For your information generally I enclose you a copy of a letter which I have from the American Ambassador in Berlin, which is of interest on certain points. I also enclose copy of a memorandum which I prepared on the purely military point of view of this problem of provisioning the civil population of Belgium. The German end of this has been submitted to the German Military Authorities and I understand from them that it embraces their complete views in the matter. I also attach herewith a little pamphlet we have gotten out, which explains our organization. I would add to the data in this pamphlet that in conducting the canteens for the destitute in Belgium, the communes make a return to our organization, showing the amount of their expenditure in this work, and upon the auditing of these statements, the communes are given a benevolence amounting to two-thirds of such expenditure, and where necessary they are given a loan amounting to the remaining one-third, the object of this discrimination being to force economy on the communal authorities. The total of these benevolences and loans amounts to the cost of maintaining the canteens, upon which there were last week about 1,400,000 people. I shall be delighted to supply you with any other information that I can give you. Following the conversation that I had the pleasure of having with you yesterday evening it is understood that toward the end of each month you will have sent to me the list of the engagements which the C.R.B. estimate they will have to make for the following month and that as soon as the agreement is established of the figure of the engagements, I will have opened for you a corresponding credit in English or American gold. By this means you will always be covered and you will no longer have to take any personal engagement. This examination of the situation for the month of January has been made by M. Carton de Wiart and myself as a check on M. Sengier, and it is understood that I will put for this period a sum of £1,000,000 at your disposition, on my return to Havre. The second question about which you spoke to me concerns the case of losses incurred, notably in the case where, on account of a drop in the prices of products in Belgium, the Comité National might not be in a position to realize at their cost-prices importations, made by means of the advances of the Belgian State. It is formally understood that the Commission for Relief in Belgium as well as the Comité National are only, for the sums which the State advances to them, attorneys of the State, and have therefore no responsibilities beyond the execution of their commission. Consequently a loss of this nature like all similar losses, will be supported by the Belgian State. I have this morning sent copy of this letter to Mr. Francqui, President of the Executive Committee. I take advantage of this opportunity to tell you again in the name of the Belgian Government how much we appreciate your efforts, as efficacious as disinterested, to assist the unhappy population of Belgium, and how much we are grateful to you. This appropriation of £1,000,000 was the second advance of this amount which had resulted from Hoover's negotiations with the Belgian Government begun in November. The first million had been turned over in the middle of December. This Government was a refugee at Havre, beyond the frontiers of its country, cut off from its normal sources of income, and dependent on loans from the British and French Treasuries for its future expenditures. It had obligations, however, within Belgium in the form of pensions and salaries of Belgian State employees which it greatly desired to meet. The German Governor-General in Belgium had agreed that these payments should be made through the medium of the Commission. The Belgian Government, from balances brought out upon the retreat, or from charitable funds coming to it directly, or possibly from Allied loans, thereupon made initial payments to the Commission. The relief organization in turn undertook to liquidate Belgian Government obligations in Belgium to like sums from the money received from the sale of its imported provisions. The exiled Belgian Government was in no position to guarantee the continuation of these advances from its own resources. Hoover, therefore, continued vigorously to press the British Government---which was the banker of the Allies---to formally authorize exchange operations and to furnish an adequate and regular subsidy in order that the Commission could maintain the necessary program of importations. I had a meeting today with Sir Edward Grey at which he informed me semi-humorously that we need not hope for financial support from the British Government. I presume this was apropos of a certain amount of agitation being carried on by the Commission in this direction. He then stated that seriously so long as the Germans continued to levy indemnities(81) on the Belgian people the British Government could not be expected to contribute to this work. I represented to Sir Edward that the British people had entered upon the greatest war of history for the sole purpose of maintaining the Belgian people; that it appeared to me that after this war had been fought at the enormous loss of human life and property which was in progress, it would be a cynical ending if the civil population of Belgium had become extinct in the process; that it was of little use to fight the war and find that only an empty husk remained; that if the food supplies of this Commission were to cease for a week the decimation of this population would be begun and it would be completed within ninety days. I informed him that at our last interview he had spoken strongly as to the British inability to help us because of the food levies by the Germans, and that in consequence I had made representations to Mr. Gerard. In these representations I had informed Mr. Gerard that the food levies greatly disturbed the British Government, who felt that we were simply supplying deficiencies created by the Germans, and that I felt the continued permission of the English to carry on our work was seriously jeopardized by these levies. As a consequence of these representations Mr. Gerard had ultimately been able to secure from the German Government an undertaking that no more food would be impressed in Belgium. I informed Sir Edward further that I had felt that when we succeeded in this matter we would be entitled to support from the British Government and was disappointed that further stipulations were now raised, and that I thought it would be fair to me to know if we could expect financial support from the Government if we could succeed in these further representations. Sir Edward said that he considered, without committing his colleagues, that we should be entitled to such support. To make the matter clear, I then put it to him that I should put it up to Mr. Gerard to see if he could, by the same friendly course as previously, succeed in effecting their desire in this matter and that such acquiescence on the part of the Germans would be contingent upon direct financial support by the British Government of this Commission. To this he agreed. I then raised the question of remittances into Belgium and explained the system by which we became possessed of large sums of money from the sale of foodstuffs and the necessity of our being able to exchange all this money in order to continue our work. He expressed approval of giving us permission in this matter, subject to the restrictions that such moneys as we obtained in England against payments in Belgium were to be used solely for the purchase of foodstuffs and that such payments in Belgium were to be made to Belgians only. I then raised the question of transportation(82) as it concerned the Commission's being allowed to use interned German ships for our transportation purposes, and agreed to furnish him with a memorandum on this subject, copy of which is attached and I gathered that he took a favorable view of these proposals. He promised to let me know at an early date what the attitude of the British Government would be. The two questions which I raised with you today were Shipping and Exchange on Brussels. Owing to the difficulty of obtaining shipping and the exorbitant prices which we have to pay for transport of food from the Atlantic seaboard, it occurred to us that it might be possible, in view of the special nature of the work of this Commission, that we could make use of some of the interned German ships. With that view as a preliminary, while recently on the Continent, I opened negotiations with certain German shipping firms to find out whether we could obtain these ships on reasonable terms, and having found that this was possible, I then took the matter up with a Dutch shipping firm and with the Dutch Government, to determine if such ships could be taken over by the Dutch shipping firm in question on terms to be arranged between them and the Germans, in such a manner as to bring them under Dutch registry and enable them to fly the Dutch flag, we in turn to charter the ships from this Dutch firm. I am now advised that this portion of the transaction is also feasible, both from a shipping and Dutch Government point of view. The remaining question, therefore, is the assent of the Allied Governments to these ships putting to sea under these conditions. At the present time, we are asked 9/6d per quarter for the transport of wheat from New York to Rotterdam. We should obviously only make use of these interned ships if we could get them at not more than the rate in normal times, or say about 3/6d per quarter. The actual saving on the tonnage which we have to transport would amount to over £80,000. If the British Government could see their way to countenance this transaction, we should be glad to submit to any reasonable conditions. These I presume would take the form of stipulations that the ships should be used solely for the conveyance of food for the purpose of this Commission, and as a safeguard, I might suggest that if a supercargo appointed by the British Government could travel at all times with each ship, it would facilitate confidence in such assurance. This Commission would of course undertake to report immediately they had ceased to use any given ship. I cannot but think that the substitution of these ships for British ships would tend to ameliorate the present difficulties of conveying food to the United Kingdom, for at the present moment we have under charter between 40 and 50 British ships. Our entire traffic could probably be carried on by the regular ply of about 20 normal tramp steamers of the ordinary cargo type. As I explained this morning, on the provisioning side of our work we sell, under restrictions, a certain proportion of foodstuffs which we import into Belgium, and we have a final residue of money accumulating at our Brussels office. The continued revolution of our working capital, which has been supplied by the Belgian bankers, and therefore the continuance of this side of our work, depends to a considerable extent on our ability to convert the moneys which we get in Brussels into pounds and dollars. With this end in view, I took up the question of the balances held by various Belgian banks in London and New York, and I could secure the payment to me of a considerable amount of such money as against the payment, on the other hand, of local currency in Brussels. This transaction does not amount to the importation of actual new money into Belgium, and is not in effect trading with the enemy, because such payments would be made under proper safeguards to Belgians only. As a matter of working machinery I would propose to operate the exchange through the Banque Belge pour l'Étranger in London and the Société Générale in Brussels, both of which are purely Belgian institutions. We have done a certain amount of exchange in a small way to individuals in Belgium, as an actual matter of relief, i.e., we have accepted moderate sums of money here and made similar payments to Belgians in Belgium who were in distress, thus enabling such people to buy food from us and keep our circuit revolving. The question of this exchange has an humanitarian aspect outside of the work of this Commission, in that some of the Belgian banks, having exported their balances prior to the occupation, are now in the position of no longer being able to pay out to their depositors in Belgium, thus inflicting a new order of hardship on these people. By taking advantage of this system, which I propose to set up, these people would be relieved. We should of course be glad to agree that any moneys coming into our hands in this manner would be used for the purchase of foodstuffs on this side, and that any payments which we make on the other side should be made to Belgians only. Had a conference today with Sir Edward Grey on the question of the British Government and the financial support of the work of this Commission. Sir Edward said that so long as the Germans continued to levy indemnities on the Belgians in their present exhausted state, the British Government could not give any financial assistance to this Commission whatever, but that if the Germans would undertake that no such indemnities should be levied the British Government would consider themselves under the obligation of supporting the Commission largely. Inasmuch as the indemnities levied in Belgium at the present time cannot be yielding any very considerable actual payments, it occurs to me that possibly your recent success in securing amelioration of the food levies might be extended to money also and might even be coupled with the stipulation that the British should support the Commission. Learned from Sir Gilbert Parker by phone that British Government intended publishing Sir Edward Grey's offer. (84) I subsequently saw Lord Percy and represented to him that this course would defeat any hope of negotiations with the German Government. If the British Government's object in making the offer was to gain political capital it was their own business and I would take no further interest. If they were genuinely anxious to secure the alleviation of the Belgians and also to help the Commission, it must be suppressed. He agreed and said he would speak to Sir Edward. Subsequently saw Sir Gilbert Parker and Sir Claude Schuster and they rather unwillingly agreed. I, today, had a meeting with Mr. Lloyd George, Chancellor of the Exchequer, at which there were present Lord Emmott, representing the Committee on Trading with the Enemy, Lord Eustace Percy, representing the Foreign Office, and later on the Attorney General, Sir John Simon, and a representative from his department. The occasion of the meeting was the discussion of the question of the exchange of money with Belgium, and I stated that we were importing foodstuffs at the rate of from £1,250,000 to £l,300,000 per month. That to reduce this discussion to simple terms, we might state that the whole of this foodstuff was sold and that the monies therefrom came into the possession of our Brussels office in the shape of Belgian National Bank notes, which were practically the only circulating medium in the country; and that, on the other hand, we had to support about 1,400,000 destitute people, for which purpose we made allocations of cash to the communes with which to conduct the public canteens. That in terms of values these allocations would necessarily amount to from £500,000 to £600,000 per month, thus leaving from £700,000 to £800,000 per month of accumulated monies in our hands; and that if we were to succeed in this enterprise of feeding the Belgian people it was necessary for us to bring this money out of Belgium in order to reinvest it in food; that Belgian National Bank notes were of no value out of Belgium, and that therefore we had hit upon the plan of accepting cash in London or New York from Belgian individuals or institutions and making the corresponding payments from our Brussels office to their order; that this scheme did not imply the transfer of any actual gold or silver into Belgium. Mr. Lloyd George stated that he had put his veto upon the project, because he felt that, indirect as the matter was, it was certainly assisting the enemy, and that this assistance would take place in several ways. In the first instance, we were giving the Belgians more food resources with which to stand requisitions in food by the Germans; that we were giving them more resources generally with which to stand monetary levies; and that beyond all this, in relieving the Germans from the necessity of feeding the civil population we were directly prolonging the war, which was bound to be one of wholly economic character and that economic pressure was the principal method by which the Allies would ultimately win. He expressed the belief that the Germans would, in the last resort, provision the people of Belgium; that our action was akin to the provisioning the civil population of a besieged city and thus prolonging the resistance of the garrison; that he was wholly opposed to our operations, benevolent and humane as they were; and that therefore he could not see his way to grant our request. I pointed out that, first, as to the requisitioning of food, the Germans had given an undertaking that after the first of January no such requisitions would be made, and I read out to him the undertaking which had been given to the American Minister in Berlin and informed him that we were satisfied from the many agents that we had in Belgium that the Germans were carrying this out with the utmost scrupulousness. I furthermore informed him that the Germans had impressed none of our actual food. Also, I stated that I did not believe that the feeding of the civil population increased the resources which they had available for money levies; that we were introducing no new money into Belgium, but were simply giving circulation to the money already existing, and that there was no danger of the Germans taking the money which we collected for foodstuffs because that money was in the possession of the American Minister. On the second point, as to whether the Germans would ultimately provision the civil population, I told him that I was satisfied that they would not do so; that when we undertook this labor we undertook it with the greatest reluctance and our first move was to satisfy ourselves that this population would starve unless America intervened and converted the hitherto negative quality of neutrality into one of positive neutrality; that as proof that the Germans would not provision the civil population I thought it was desirable that he should understand the German views on this question, and I recited to him the confirmation by the German military of the current statement in Germany that there was no clause in the Hague Convention obliging the Germans to provision the civil population of Belgium; on the contrary, it incidentally provided that the civil population should support the military. I told him further, that the Germans contended that the Belgians were a people of great resources, that these resources would become valuable at once on a partial recovery of industry, that this recovery of industry could take place instantly they were given a port through which they could trade with the neutral world, that in taking the port of Antwerp and opening it to neutral ships they had given the Belgian civil population a means of provisioning themselves, but that this outlet had been blocked by the British Navy and the British must therefore bear the responsibility. Further, that the Belgian population, by continuing its hostility and its passive resistance was assisting the Allies by compelling the Germans to operate the public services, rendering trade useless to them, also the arsenals, and requiring from them a considerable army of occupation; and that as the Allies do all this they must take the responsibility of these people starving. Furthermore, the Germans contend that while they have ample food supplies to carry their own people through the struggle, they have not sufficient to carry on their backs the 10,000,000 people in Belgium and France inside their lines; and that as they are struggling for national existence they must feed their own people and attend to their own military exigencies first. I pointed out that I did not offer these arguments as my own but to illustrate the fixity of mind by which the German people justify their action in refusing to feed the Belgians, and asked him if he could conceive for one moment that with this mental attitude of conviction on their part that they were right and the Allies were wrong, they would be likely to feed the Belgians. I pointed out that starvation had actually occurred in Belgium; that some, although perhaps little, riot had occurred, but sufficient to indicate the fixity of the Germans in their intention. I further pointed out the position of the French people in the Meuse Valley, who had not had our assistance and were dying of starvation although under German occupation; and I expressed the conviction that the Germans would never feed the civil population. He denounced the whole of this as a monstrous attitude; to which I replied that, be that as it might, one matter stood out in my mind and that was that the English people had undertaken this war for the avowed purpose of protecting the existence of small nations, of vindicating the guaranteed neutrality by which small nations might exist, for the avowed purpose of guaranteeing to the world the continuance of democracy as against autocracy in government; and that it would be an empty victory if one of the most democratic of the world's races should be extinguished in the process and ultimate victory should be marked by an empty husk. I said that the English people were great enough to disregard the doubtful military value of advantages in favor of assurances that these people should survive, and I felt the obligation went even further than mere acquiescence in our work and extended to an opportunity to the English to add to their laurels by showing magnanimity toward these people, a magnanimity which would outlast all the bitterness of this war. Mr. Lloyd George stated to his colleagues abruptly: "I am convinced. You have my permission. I would be obliged if you gentlemen would settle the details of the machinery necessary to carry it out." Then turning to me he said that I would forgive him for running away, but that he felt the world would yet be indebted to the American people for the most magnanimous action which neutrality had yet given way to. The Commission for Relief in Belgium understands that the British Government is prepared to grant permission to British banks to honor drafts drawn upon them in favor of the Commission by Belgian banks or firms having credits with them, provided that the Commission gives certain undertakings as to the use of such money. 3. That the Commission will furnish the Secretary of the Treasury and the Foreign Office a weekly list showing the origin of such sums and the names of the persons to whom payment is to be made in Belgium. With this definite sanction of the plan of exchange on the 21st January, the Commission at once set up a commercial exchange department, and though this source of income was not as productive as first expected,(85) the relief organization secured the use of considerable sums at a time when funds were very short. This favorable decision indicated a more sympathetic attitude of the British Government toward the relief work; but the Commission's major problem of securing an adequate and regular subvention from the Allies remained unsolved. "BRYAN, Secretary of State, Washington, D.C.
"Potatoes and meat, upon which Belgians have been partially dependent up to present, are now being rapidly exhausted, and the cost of foodstuffs required to keep this population alive must increase shortly from six million to ten million per month. Furthermore, within thirty days three million French people north of German lines will be in similar position to Belgium. "Another fifteen million dollars will have absolutely exhausted the whole banking and other resources which we can possibly look forward to, leaving a period of three to four months before next harvest entirely hopeless, unless support can be obtained from the belligerent governments. I believe the Allied Governments, despite their view that they have no responsibility and that it is a military disadvantage that these people should be fed from neutral sources and that the duty lies on the Germans, could be brought to make substantial contributions to our problem, provided the Germans would cease to wring monetary indemnities from these people, and would extend their undertaking as to requisitioning foodstuffs so as to cover all food supplies. To have this population thus fed must be, even on military grounds, a vast advantage to the Germans, which. far outweighs the value of the money which they now secure from their present methods; and from a humane point of view, if this situation is driven to its logical extreme, the moral responsibility for the decimation of this population must be laid at the German door. I am arriving in Berlin February first for the purpose of making representations to the German Government that if they would agree to stop all requisitions of every character, and would do so conditionally upon the Allies giving adequate financial support to this Commission, I have reason to believe I can carry out the Allies' end of the contract, and I need support from Germans in America. I therefore appeal to you, not in your official capacity, but as a leading American in position to discuss this question in influential way with Bernstorff and Dernburg and for pure reasons of humanity. The Germans cannot afford to have these issues tried in the court of American public opinion, and they can well afford, not only from a point of view of military advantage but also of American public opinion, and above all of humanity, to have this question settled on the above lines. I believe the Allied Governments have every confidence in the integrity and ability of this Commission to carry out the work, and great as the sacrifice may be on our part, we should find ample compensation in the carrying on of this task in the prestige which it would win for our country and its ideals." The problem of feeding the starving population of Belgium has grown beyond the resources of public charity, according to a statement of Herbert Hoover, made as the result of a special session of the Commission for Relief in Belgium held today to consider the critical situation arising out of a series of special investigations just completed. Mr. Hoover said: "The Commission takes the gloomiest possible view of the ultimate future. The problem is rapidly growing beyond the reach of private philanthropy. With the help that the Commission hopes from America during the next two months, and the financial arrangements which have been completed for loans and exchange we can maintain supplies at the rate of six million dollars per month to the end of March. Before that time, however, three .new forces will intervene, which make the whole situation materially worse. The first of these is the rapid exhaustion of the limited vegetable and meat supplies in Belgium, which will involve a constant increase in the amount of food shipped into the country; the second, that the three million of French people inside the German line will be reduced to the condition of the Belgians in another thirty days and our problem will not be seven but ten million people to feed; the third is that while a considerable portion of the Belgian people have hitherto been able to pay for their food, the stoppage of the industrial clock and the drain of indemnities is now driving them in larger and larger proportions to the wall. If all these people are to be kept alive someone has got to furnish, some way or somehow, from twelve to fifteen million dollars' worth of food every month, from April until August, when the new harvest will carry on for a little while. Up to now we have delivered about twelve million dollars' worth of food into Belgium, and as stated above, we have in sight about another twelve million dollars. Thus we and our friends have provided by one means and another, something like twenty-four million dollars' worth of food for these people. We have now reached a point where, so far as we can see, the problem will become hopeless of solution unless the belligerent powers can come to some agreement with regard to this imprisoned population. We are informed from the German side that there is not only no provision in the Hague Convention obliging an occupying army to feed the civil population, but that, on the contrary, there is a provision that the civil population can be called upon to support the occupying army. More broadly than this, however, the Germans state that the people of Belgium have always imported their food supplies and that this population still possesses resources; and that could a gate be opened through their double wall of steel by which they could import foodstuffs and raw material and export their industrial products and thus restart credit, they could provision themselves. That in taking the harbor of Antwerp and in throwing it open to neutral trade the Germans have acquitted themselves of the responsibility, because nothing prevents the normal flow of trade except the Allied Navy. The Germans state, furthermore, that the Belgians by their continued hostility require a considerable force in occupation and, by refusal to operate public services, necessitate more soldiers to carry on these services, and that the Allies benefit therefrom and are therefore morally obliged to at least open the gate of trade to this population. They state further that while the German food supplies, with great economy, are sufficient to carry this war to successful fruition, if they have to take upon their backs an additional ten million people their stores would be seriously jeopardized, and that it is the duty of the Germans to feed their own people first; that as this war is a war to maintain German national integrity they do not propose to jeopardize the issues in such a manner. The English and French affirm that they cannot allow free trade with Antwerp, for there can be no assurance that the enemy will not be supplied thereby; moreover, in the traditions of international law it is the duty of the occupying army to provision the civil population and the importation of foodstuffs into Belgium and Northern France would relieve the Germans of their moral and legal responsibilities. Broader than this, however, although the civil population alone be supplied with foodstuffs, the Germans are relieved of the drain which would otherwise have fallen upon their own stores. That in general the situation is akin to that of a siege where the succor of the population relieves the moral and physical strain on the garrison; that the ending of this war will be by economic pressure and any relaxation of this pressure assists the enemy. We were convinced at the beginning that the fixity of opinion on both sides as to the righteousness of their respective attitudes was such that the Belgians would starve before responsibility could be settled, for the logical consummation of these views could only mean the decimation of these ten million people. During the three months that we have been at work we have listened daily to these arguments and it is certain that were it not for the stream of food poured in by this Commission this decimation would have already begun. From the beginning all belligerents acquiesced in our feeding these people, for both felt an impasse which could not otherwise be bridged. As time has gone on, the Germans have, on their side, demonstrated their desire to help by the aid they have given us in the scrupulous adherence to our undertaking that these food supplies should reach only the civil population, and in the undertaking to cease requisition of food which we must replace; and the Allies have facilitated the passage of our ships and in innumerable helpful ways eased the working of our machinery. We have by degrees built up a confidence on both sides as to our absolute neutrality both in word and deed and as to our national capacity to carry on this work; and in consequence there is gradually growing a feeling on both sides that there possibly lies in this Commission a via media through which an agreement might be found for a further step. This view grows in strength as the possibility of the world's greatest tragedy looms larger and larger; but if accommodation is found it must be found quickly. We cannot wait until the end of March before we begin to charter ships and collect the food; it must be done at once if the flow is not to be interrupted. On the English and French side there are many who say that their people should be prepared to abandon the military advantages and give way on contentions of moral and legal issue and come to the support of these people through this Commission; but they add with vigor that they cannot be expected to go so far so long as the Germans continue draining the resources of these wretched people by way of monetary levies and the continued requisition of foodstuff outside the list agreed with this Commission. On the German side we are told that the German people have not themselves food supplies to spare, and we believe it is true. We are told that they cannot take food from their already short supplies, to feed an additional ten millions of people belonging to their antagonists. They say, however, that these people must be fed and that no action of the Germans should stand in the way of the work of this Commission; and that, although it may mean the giving up of the undoubted right of the occupying army to secure supplies either in money or in kind, the German people are great enough and humane enough to forego all these military advantages rather than that even the shadow of the responsibility for such a debacle should be cast at their door. Here is, then, a possible ground on which, on one side, the English and French should give us financial support to feed their allies and the French their own blood, and the Germans should cease to reduce, through levies and requisitions, the abilities of these imprisoned people to help themselves. If we cannot get an agreement of this sort we must struggle on as best we can with the support of the charitable world, to whom our country has given such a magnificent lead. We will feed as many people as we can. We will skimp a nation---we will even gamble with starvation---but stretch the food supplies as we may, we must say positively that it is impossible for us to save more than a modicum of this population unless the belligerent powers can be induced to come to an arrangement. If all fails, the neutral world and future generations will lay the responsibility for the decimation of these people at the proper door, and no mixture of military reason and diplomatic excuse will cloud the issue. The magnificent generosity of the American people, which has proved neutrality no mere barren negation, will have been wasted unless each of these belligerent peoples comes to its rightful share in saving from starvation these millions of men, innocent women, and children. We have stated our case bluntly and frankly. Our only court of appeal is American public opinion, and it is for America to say whether a crime shall be committed which will bring this generation down in infamy to posterity. I arrived in Berlin Monday evening at about 7:30 and found Dr. Rose(86) on entering the Adlon Hotel. After dinner I discussed the situation with Dr. Rose and he told me that it was probable we could secure the German Government adherence to our work which we wanted. On Tuesday morning I called on Mr. Gerard and explained to him our difficulty with the Allies on German requisitions and indemnities on Belgium and the necessity of coming to some settlement with the Germans in the matter. He told me that the undertaking which he had received from the Under-Secretary of State, Zimmermann, contained the reservation, of which we were aware, that the Germans would not requisition food which it was necessary for us to replace. Mr. Gerard explained to me that at the time this arrangement was settled verbally no such reservation was made, in consequence of which he telegraphed me the full German acquiescence; but that two weeks later on, having it confirmed by letter from Herr Zimmermann, he found this reservation introduced. He was accompanied on his original visit to the Foreign office by the Netherlands and Spanish Ministers, and upon receiving the note containing the reservation, he had communicated with these two Ambassadors and they both expressed the utmost astonishment at the change which had been introduced as not having been in accordance with the verbal settlement and of course vitiating a large portion of the value of the undertaking. (The levies of all descriptions of food except bread particularly in the operation zone have confirmed the military view of this agreement, and the general outbreak of such requisition looks as if they were intending to denude the country before the question of replacement arises. The statements of various commandants---made to the local burgomasters in making such requisitions---to the effect that the Americans would feed the people as soon as the food is gone, are an indication of general knowledge of the reservation in the agreement.) Mr. Gerard expressed himself in the strongest terms in regard to the matter and stated that he felt it was a disgrace that the American public should be imposed upon to furnish food under such circumstances, and that he felt strongly that we should withdraw from the field entirely unless these wretched people were to be better protected from the military. He expressed his confidence and kind feeling toward the German civil officials, but stated that before an order could reach execution, it was obviously within the power of a hundred despots in times such as these. On Tuesday the 2d of February, Mr. Gerard took myself, Mr. Heineman, Mr. Hulse, and Mr. Gibson to call on Mr. Zimmermann, the Under-Secretary of Foreign Affairs. I presented to him the position in which the Commission found itself and the absolute necessity for assistance in working out its problems for the German Government. I reviewed the work which we had done, the circumstances under which we had begun operations, the volume of the work which we are now handling, and the necessity of government co-operation. I proposed to him the abandonment of the contribution from Belgium to be coupled with a subsidy in gold from the English and French Governments to this Commission. Herr Zimmermann took a great interest in the whole position, and the conversation lasted over one hour. He finally expressed himself as in favor of our proposals and stated that he would assist us to the best of his ability, but remarked that men of peace have but little influence in these times. He asked to have a complete memorandum sent to him, which I agreed to prepare. In compliance with the wish you expressed on the second instant, when I had the honor of presenting to you my colleagues of the Commission for Relief in Belgium, I take pleasure in sending you herewith three memoranda setting forth certain matters in which the Commission is deeply concerned. I. A note setting out the bases of reorganized relations which the Commission for Relief in Belgium is desirous of effecting with the Imperial German Government. II. A memorandum upon the problems and position confronting the Commission for Relief in Belgium if it is to continue provisioning the civil population. III. For your information a copy of a memorandum furnished by the British Foreign Office embodying the Commission's understanding of the attitude of the belligerent governments toward the provisioning of Belgians. My colleagues of the Commission will, I need hardly say, greatly appreciate any efforts you may find it possible to make to secure early and kindly consideration for the matters set forth in these documents. 1. The Commission for Relief in Belgium is a purely neutral body created by the American Ambassadors and Ministers in Brussels, Berlin, and London, the Spanish Ambassador in London, and the Spanish Minister in Brussels, to give effect to the various undertakings entered into with the German and English Governments, providing for the import of foodstuffs to the civil population in Belgium. These foodstuffs are distributed by the Commission in conjunction with the Comité National de Secours et d'Alimentation, a portion of the foodstuffs being sold to those who can afford to pay and a portion distributed free under proper restriction to the destitute. 2. The monies collected in Belgium for that portion of the foodstuffs which are sold cannot be turned into gold. This money is used locally to buy potatoes, meat, etc., for the destitute, and the remainder is given to the communal authorities to enable them to pay communal salaries, school teachers, etc. The monies that are thus collected do not, therefore, assist the real problem of the Commission, that is, the finding of gold with which to purchase foodstuffs in the neutral countries. 3. The foodstuffs have hitherto been secured by gift (principally from America) and by advance from the Belgian Government, and from the Belgian banks out of the balances which they have abroad. The philanthropic sources are totally inadequate to meet this problem, and owing to the attitude recently taken by the English government, the purely financial side of the operations is about to break down. 4. If the civil population of Belgium are to be kept from starvation, and therefore if order is to be preserved in the country, the amount of imports of food must not only be maintained, but must probably be increased. While the Commission has a residue of resources to carry on the work for a short time, unless these imports are to be interrupted, it is imperative that further arrangements shall be made for finance. It requires over two months between the charter of ships and the purchase of food abroad before the food can be delivered into Belgium, and therefore, it is imperative to take immediate action if the flow of food is not to be stopped. 5. The stoppage of the industrial clock and the consequent cessation of exports from Belgium, and the continuous monetary levies by the occupying army, and the rapidly approaching exhaustion of the local supply of potatoes and meat has placed the whole problem entirely beyond the financial capacity of the Commission, unless some basis of accommodation with the belligerent governments can be provided for adequately furnishing assistance. The supplies sent into Belgium must quickly increase and if the French(87) population within the German lines are to be supported, they must be supplied with foodstuffs of great value. 6. It must be obvious that the continuous feeding of this population is of the greatest military importance to the Germans, for a starving population on the lines of communication would be the greatest menace. The humanitarian tradition and history of the German people are, however, sufficient warrant for the complete assumption that the decimation of this imprisoned and besieged people would be most repugnant to them, and that if no other reason existed, the Germans would not, even at the cost of personal sacrifice, consent to the starvation of these people. 7. The exercise of the undoubted rights of the occupying army to provisions from the civil population was largely abandoned by the German Government early in January, when the impending exhaustion of foodstuffs became so evident. The reports, however, of isolated cases of the requisitioning of cattle, pigs, potatoes, etc., by the army since agreement was entered into, have greatly damaged the Commission's effort to raise funds, as there has been a great outcry raised that the statement by the Commission that such requisitions had ceased was untrue; and the effect is to seriously curtail the efforts of philanthropic supporters of the Commission in neutral countries. The Commission, therefore, earnestly desires that the directions as to requisitioning foodstuffs of any kind in Belgium should be made broad enough and specific enough to cover all possible eventualities as set out in the proposed memorandum of agreement. 8. Of much wider importance, however, than the above is the fact that without governmental aid from some source the efforts of the Commission must by degrees fall far behind the necessities of these people. The Commission, therefore, considered every source of supply possible and decided that under the present military situation the Germans could not be expected to furnish food supplies from their own stores. The Commission, therefore, approached the English, French, and Belgian Allies and asked for finance on the ground that this civil population was of their own blood and that the primary duty devolved upon them. The Belgian Government made an undertaking to support the Commission financially, but beyond a small amount this undertaking was in turn dependent on the support which the Belgian Government should receive from the English and French Governments. These latter Governments have now positively refused to help on the ground that they would not provide public money for food purchases because this would amount to assisting their enemy by relaxing the economic strain which he would otherwise be under to support the Belgians himself. While these Governments do not object to other parties or neutrals supplying food, they were not themselves prepared to assume an additional burden in assisting. After repeated representations and a statement of what the Commission deemed to be the German point of view, the English Government informed the Commission that, while prepared to alter their view to some extent, they would not do so because of the continued levy of money contributions and food requisitions upon the Belgians. The English Government takes the attitude that it would be absurd for them to furnish gold from their own coffers for foodstuffs to be imported into Belgium while the Germans were requisitioning similar food, and or contributions of money from the Belgians, as the import of food to the Belgians is in itself a benefit to the Germans, and if the English are to give way to the extent of finding the gold necessary, then the Germans should likewise meet the situation half way. The Commission replied to this by asking of the English and Allied Governments if they would be prepared to finance the Commission in case the Germans would be willing to meet half way by abandonment of requisitions of food and the money contributions on Belgium. To this the Commission was informed that these Governments would give financial support to the Commission in such an event, but not otherwise. 9. The Commission, in its deep desire to serve these wretched people, therefore respectfully submits to the German Government that its efforts must greatly diminish and ultimately fail altogether unless the Commission can receive such undertakings from the German Government. And the Commission suggests that if the German Government will abandon the collection of the monetary contributions on Belgium and the requisitioning of foodstuffs, then the Commission is in a position to impose upon the English Government the duty of finding the gold necessary to buy these foodstuffs, and the Commission has received assurances from the English and French Governments that such gold will be forthcoming. 10. The Commission has no other desire than to ameliorate the condition of this helpless people, and feels that in applying to the German Government for co-operation in the prevention of the collapse of its work, it will receive consideration commensurate with the broad grasp which the German people have demonstrated that they take of the problem growing out of this titantic struggle. The Commission is convinced that unless this plan is carried out, the German Government will have a starving population of 6,500,000 people on its hands within a few weeks. At 6 o'clock I had a meeting, accompanied by Mr. Heineman, with the Finance Minister, Mr. Helfferich. Mr. Heineman having seen him previously, he was well informed as to our proposals. He stated at once, however, that the proposed abandonment of the contribution from Belgium was wholly and absolutely impossible. He stated that Herr Zimmermann could not have understood what we meant. He stated that some other way would have to be found to assist the Commission, and suggested that we go to Brussels and place our requirements before the Local Government, and that he would ask them to assist us in every way possible. I told him that this was a matter which concerned the Imperial Government itself, that the questions of feeding seven millions in Belgium, three millions in France, and ten millions in Poland(88) were all wrapped up in one question, and that was the question as to the control of imported foodstuffs through neutral committees, and that I presumed these committees would have to be, from the nature of things, American, and that it was due to anybody who undertook such a labor that his requests should receive attention from the highest. I explained the voluntary character of our effort, the philanthropic origin of our funds, the additions which we had had to these funds from Belgian sources, and the absolute vital importance to the German Government from a military point of view that we should continue our action, and stated that unless we could be properly recognized by the Government and helped in our work by them, it would ultimately dwindle down to a service totally inadequate to the millions of people. The Minister then made a series of suggestions as to other methods. He proposed that the contribution on Belgium should be increased and that we should be handed the increased contribution. To this I replied that this would be nothing but paper and that we must have gold. He then suggested that we might have bills drawn by the people from whom we purchased foodstuffs, and have these bills accepted by the Belgian banks, and that through the friends of the German Government in New York they could arrange to have these bills discounted and even renewed. He explained to me that Mr. Warburg,(89) the head of the banking firm of Warburg and Company of Hamburg, was a brother of Mr. Warburg of Messrs. Kuhn, Loeb and Company of New York, head of the American Government National Reserve Board, and that the National Reserve Board was anxious to set up a large business in bills, diverting especially South American bills from the London to the New York market, and that Mr. Warburg in New York would be in a position to induce the various banks to discount these bills, and he stated that no doubt they would be renewed from time to time until the war was over. I explained to him that there were two weaknesses in his proposal: The first was that I saw no reason why any Belgian bank should accept these bills, as we had no money to pay any Belgian bank; that although we sold a portion of the foodstuffs the money which we received was dissipated in caring for the destitute and in paying communal officials; and that I could see no more reason why a Belgian bank should accept such bills than any other bank in the world; the other difficulty was that the amount of such bills would run into ten millions of dollars per month and that it would go on for nine months at least. We had some argument on the question and he stuck to his point tenaciously and said we should see Mr. Warburg, with whom we had already discussed the matter. He again repeated that the idea of abandoning the contribution from Belgium was wholly impossible for three reasons: (1) The technical arrangements under which the contributions had been set up requiring the abandonment of the rights of local generals, and other interdepartmental arrangements which could not be broken down; (2) it would be equivalent to the German Government paying for the food of the Belgians; and (3) the English Government could say that it compelled the Germans to do it. I replied that this was not my view; that the possession of the contribution placed in the hands of the Germans a club which they could use to force the English and French to pay out two million pounds per month in gold to feed the Belgians; and that all it meant to the Germans was the abandonment of forty million francs worth of doubtful paper. He suggested that we might expand the contribution, the Société Générale to discount the provincial bonds as in the old case, and to print similar currency against them, and that the Imperial Government might entertain some method of guaranteeing their exchange value and interesting their friends, Messrs. Warburg and the German agents in New York, to raise money against such guaranteed exchange. I pointed out that sooner or later this would mean the export of gold from Germany, that in any case it means the inflation of the Société Générale currency to a disastrous point. I informed him that in any event his method was one which required the Americans to loan the money, the Belgians to repay the loan, the Germans hanging on to their indemnity from Belgium; that if I went back to England and replied to question of the English Government that the Germans had refused to relax the pressure on Belgium, the English must at once give publicity to their offer, and that I did not think any American banker would care to loan money to the Belgians under such circumstances. We parted in order to see Mr. Warburg at the Adlon Hotel. At 7:30 1 had a meeting with Mr. Warburg, accompanied by Mr. Heineman, at the Adlon. He informed us generally of the position as he understood it from the Minister of Finance, and we discussed the matter at some length. He agreed with us that there was no banking operation in it unless we secured a similar amount of money to the accepted bills and deposited this money somewhere. He also agreed that the amount of money involved was very much larger than he had been led to believe. 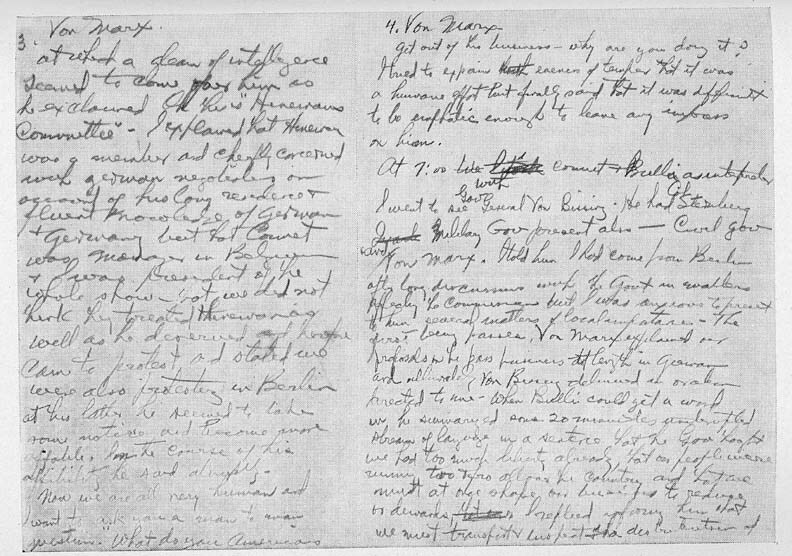 He informed me of the success he had had with discounting the bills for the cotton shipments from the United States to Germany and that he believed through Kuhn, Loeb and Company in New York and the influence which they maintain he could secure the discount of a considerable amount of grain bills for our purpose, but that as there was a break in our financial chain due to the fact that we distributed all the money, it was therefore obvious that this could not be done. We discussed the project of increasing the Société Générale's currency issue placed on an increased contribution, and in response to a remark of mine that if I were the manager of the Société Générale I would commit suicide before I would create a paper currency of what would apparently amount to nine hundred million francs secured on the assets of that bank and of the so-called provincial guarantees, Mr. Warburg remarked that he would have committed suicide some time ago if he had been the manager of the Société Générale. Mr. Warburg was very affable and sympathized with the humanitarian aspects of this matter, offering his services in any way which we would command. We asked him to see the Finance Minister and explain that the projects which he laid down were infeasible and that the short straight method was to adopt our proposal. He promised to see the Minister that evening. We reviewed the humanitarian aspects and the effect it would have on good-will toward Germany, with which he apparently acquiesced. by HOOVER, of a conversation with HERR BALLIN,(90) 5 February 1915, concerning the attitude of the German Government toward the financial proposals of the C.R.B. At 10:30, accompanied by Mr. Heineman, I called on Herr Ballin at the Esplanade Hotel and spent about an hour and a half with him. I explained that I had originally made the appointment with him some two or three weeks ago with a view to discussing the transfer to our service of some of the Hamburg-American freight ships,(91) but that while the negotiation for government permission was going well, things had constantly taken a change and a great difficulty had arisen before us which had prevented any further progress in the shipping matter. I then sketched to him briefly our history and present position, and how necessary it was that we should find some point of accommodation between the belligerent governments; that we did not expect then to make such a thing as a treaty directly concerning the Belgians, but we felt that we must get some positive concession from each side to the Commission if the Belgian people were not to starve. I restated to him the argument in the matter from the German point of view, humanitarian as well as military, and then reviewed the discussion we had had with the Finance Minister. Mr. Ballin stated he had had some discussion already with regard to the matter and that he did not believe the Finance Minister's proposals would hold good, and that he did think the Germans were big enough to adopt our proposals. He said he would see the Finance Minister and also the Chancellor during the day and that he would support us in the matter, as he considered that the whole problem of these captured people was the most important problem which was before the German people at the present time; that they could not be allowed to starve, that the Germans had not the foodstuffs themselves to keep them alive, and that the Germans must go a long way in the support of such neutral agencies as could solve this problem. After a considerable discussion of various points I shook hands on leaving, and as a parting word he stated: "You can depend on me to help with all my might." At 3 o'clock I had a meeting with Dr. Melchior, the financial adviser to the Finance Ministry, and also adviser to Messrs. Warburg's bank at Hamburg. Mr. Melchior informed me he had discussed this question with Mr. Warburg and with the Finance Minister, and that for technical and diplomatic reasons which he enumerated in much the same terms as the Finance Minister, it was wholly impossible to abandon the contribution on Belgium. He stated, however, that the Germans would help us, and then repeated the whole of the financial proposals which had been made to us the day before by the Finance Minister. I again went over the ground showing how these were wholly and absolutely impossible from a financial point of view; that there was no banking operation possible such as he fancied could be built up. He referred two or three times to Mr. Warburg of Hamburg, and to Mr. Warburg's influence with the New York bankers and with the National Reserve Board in the placing of commercial bills; and it became obvious to me that they were anxious to take advantage of this influential relation in placing some kind of commercial paper as a solution to this problem. After discussing the weaknesses of the Finance Minister's project, Dr. Melchior made a suggested alteration in that he proposed to follow the system of the present contribution; that the provinces should issue a bond for monies with which to buy food, to be called Relief Bonds; that the Société Générale should discount these bonds, should be authorized to issue an equivalent amount in currency, or that the Reichsbank should rediscount the bonds from the Société Générale or accept the currency; and that with the guarantee of the Reichsbank commercial bills for the foodstuffs could be placed initially in New York and constantly renewed until after the war. I pointed out that it seemed to me they all went wrong over the question of quantities; that inasmuch as all of the money which we received in Belgium from the sale of foodstuffs is bound to melt away in the various services, the problem became one of finding the total cost of all food imported into Belgium and Northern France; that this would turn out to be a minimum of forty million marks per month, and that it must go on for say twelve months, which meant the finding of a hundred million dollars; that it was wholly and absolutely impossible to conceive that such a sum could be built up on commercial bills; that the capacity of the New York market was certainly not over ten or twelve million dollars for this purpose. I went very fully into the sentimental phases of the situation and pointed out that the whole effect of this contribution levied on Belgium in the eyes of the American public had been most disastrous from every German point of view; that here was our Commission making frantic appeals to the American people for money and food with which to save the Belgians from starvation, and coincidentally with these appeals in everyone's ears came the news of the levy of forty million francs per month; that the general expression in America was: "What is the use of pouring money and food into Belgium in order to enable the German Army to extract the last drop of blood from these people?" and that this action was drying up the wells of philanthropy at their sources. I explained to him that the Germans did not seem to be able to understand that the sentiment in the United States was not pro-English, but was pro-Belgian, and that so long as the German people continued to put themselves in the wrong with regard to Belgium, it was absolutely hopeless for them to dream of securing American sentiment. If they valued American good feeling, the maintenance of press bureaus in the United States, the expenditure of monies and effort in an endeavor to build it up, was a hopeless waste so long as the telegraph wires carried news daily and weekly of the forced extraction of blood from the Belgians. In any event Dr. Melchior did not seem particularly cordial upon our point. He said he would discuss the matter at further length and give it more consideration. In any event they wanted no transactions with England directly or indirectly. I pointed out that there must be transactions with England, as the food must pass English waters and English ships were used; and that if they wanted the Belgians fed, any proposition put up would have to have the approval of the English; and that it was useless to cook up schemes which were impossible for me to carry with the English; that, like it or not, if they wanted the service of this Commission or any other American body the Commission was going to be consulted in any project and the approval of every interested party secured, or we would withdraw and leave these 10,000,000 people to the Germans. At 4:30 1 accompanied Mr. Gerard to call upon Herr von Jagow, Minister of Foreign Affairs. He told me he had had some discussion with Mr. Zimmermann, and also with the Chancellor and with Mr. Helfferich, and that Dr. Helfferich was formulating a plan to solve our difficulties. He stated that of course the monthly indemnity on Belgium could not be abandoned, but the matter could be solved in another manner, and stated that we had better continue our negotiations which we were carrying on with Dr. Helfferich. I stated that the proposals outlined by Dr. Helfferich were not agreeable to us, and that I felt that this matter did not lie entirely in the Finance Department, but lay largely in the Foreign Office, because it was a matter which concerned all Germany in relations and its good reputation abroad; that it seemed to me a great deal of a task to continue to feed the Belgians, no matter from what source money might be obtained, so long as the German Government continued to extract from these people a similar amount of money. I told him that as apparently the indemnity was only laid on Belgium after we had become well established in our work, I felt sometimes that we had been the cause of this terrible infliction, because if the people of Belgium had been as desperate as the people in Poland for want of food, it is impossible that the fine would ever have been imposed. He replied that the people of Belgium had enormous resources, and that forty million francs a month was much less than they could really afford to pay; that this was collected merely to support the occupying army under the provisions of the Hague Convention and that none of the money was sent to Germany; and he again affirmed that we should continue our negotiations with Dr. Helfferich, who, he stated, would help us in every possible way, as would the other members of the Government. I then took up with him the question of passes for the people employed on our work;(92) that it was almost impossible for us to obtain the passes which we needed; that there were great delays; and that the passes very often proved inadequate for the purpose for which they were issued; that we were made to feel most of the time that a favor was being conferred upon us that we were allowed to work in Belgium; and that I did think it was most necessary that the whole of this attitude and method should be revised. I suggested that in the future passes should only be issued on a request signed by Mr. Whitlock or the Chargé d'Affaires at the Embassy, but that a pass should be issued instantly upon sending in such a request; that practically I wanted Mr. Whitlock given the right to issue passes himself for this work. I then took up the question of our steamers coming up the Channel after the 18th February, the presumable date of the submarine blockade. (93) I pointed out that under the English regulations and the conditions of their charters, it was wholly impossible for these ships to go to Rotterdam by way of North Scotland. After some discussion the Minister promised to have orders issued of the most scrupulous care of our steamers. I then returned to the discussion of the indemnity question, stating to the Minister that there was one phase of this whole question which Germans obstinately ignored: that the Germans were obviously anxious to win the good feeling of the American people; that they were most severe in their denunciation of our lack of neutrality, and yet they did not take the most essential precautions to win and hold the esteem of the American people; and that if they held at least one-half of the American sentiment, they could be assured of impartiality in national conduct and therefore it was worth while to make some effort. I pointed out to him that America was not nascently pro-British, while at the present time 70 per cent of the American people were extremely pro-English; that this sentiment did not arise out of any love of England, but arose out of the fact that the Americans were pro-Belgian, and that it was entirely out of their views as to the treatment of Belgium by the Germans and their belief that the English were fighting the Belgian cause which led their feelings to lean so predominantly toward the English; and that I was absolutely satisfied that in order to win American opinion Germany must mend her methods toward Belgium; that if Germany today would take a generous and grand view and would release the Belgians from their monthly indemnity, I believed it would do more to win American opinion than any other act possible; that therefore this whole problem became one of the Foreign Office, whose duty it is to guard foreign opinion and relations; and that I hoped he would consider the thing as a problem apart from the financial schemes of Dr. Helfferich. Those schemes might be of able financial character but they implied that Americans supply the money and that Belgians ultimately repay it; and while it reflected credit on the skill of the Finance Ministry, it did not reflect any particular credit or give cause for gratitude toward Germany. Mr. Gerard pointed out that he himself had been the vehicle through which the Germans had communicated their offers to the Belgians, after the taking of Liège, offering the Belgians not only guarantees as to their national integrity, but also large indemnities; and that therefore it was not much of a step to say now that when the Belgians are completely conquered they should at least be assured their national integrity, even though they do not receive any indemnities, and that they should be free from themselves paying indemnities to the Germans. He also reminded the Minister of the Chancellor's speech on the 4th August, in which assurances were given with regard to Belgium which had not yet been withdrawn. At 6 o'clock I accompanied Mr. Gerard to a meeting with the Imperial Chancellor, His Excellency von Bethmann-Hollweg. Mr. Gerard presented to him the essential facts with regard to our position: that the question of the feeding of the Belgians would soon get beyond the resources which we could command by philanthropy or from the assistance of the Belgian Government; that if we were to feed the people of Northern France as well as the Belgians, we should require 40 or 50 million marks per month; and that the Allied Governments had refused to come to our assistance so long as the Germans continued their monetary levies on Belgium. The Chancellor stated at once with emphasis that the Germans would never give up this contribution, reiterating that it was absolutely impossible; that, on the other hand, they recognized the very necessary character of the work and were prepared to find some other method of financial assistance; that Germany wanted no help from the Allies in anything. That in the face of the world and of German public opinion they could not for one moment retreat from an act which they had taken under the full rights confirmed by the Hague Convention. He stated that financial proposals were being drawn up by Mr. Helfferich in consultation with the financial members of the German Civil Government in Belgium and that a method would be worked out which would make our path easy from a financial point of view. I pointed out that we had had discussions with Mr. Helfferich and that all of his proposals revolved around the Belgians undertaking to pay for the foodstuffs ultimately, and that in the meantime the American public or American bankers should furnish the money; and that the first part of the proposal was a matter with which I had nothing to do and must be settled with the Belgians, but I could state at once with regard to the second part of the proposal, that is, the finding of the necessary money in America, that this would meet with the strongest opposition. That I had no doubt that upon my arrival in London the English Government would immediately demand to know whether the Germans had accepted our proposal, and that I would be compelled to inform them that it had not been accepted. Upon this the English would announce to the world that they had offered to pay for the feeding of the Belgians themselves if the Germans would withdraw their forced contributions from Belgium, and that I did not believe that in the face of such an announcement the Americans would be disposed to at all facilitate the matter. Moreover, it might release the English from all feeling of responsibility in the matter. That I felt strongly that this was a matter in which both Governments must meet half way through this Commission. He stated that he could have no negotiations with the English in any shape or form, to which I replied that we were not proposing any such negotiations but merely that each Government should assent to an arrangement with the Commission. Mr. Gerard pointed out that the Commission was absolutely the only way through which the Belgians could be kept from starvation, and that in keeping them from starvation the greatest possible military service was being done to the Germans. The Chancellor replied again that it was utterly impossible that they should give up the contribution and that he could not discuss the matter on this footing; and again affirmed strongly that German public opinion would not stand for it. Mr. Gerard pointed out that he had discussed the matter with the editor of one of the most prominent German papers, who had told him that he thought it was the proper course to take; and Mr. Gerard suggested that if His Excellency would acquiesce, he, Mr. Gerard would call in a lot of editors and lay the proposal before them and endeavor to formulate public opinion. The Chancellor said this did not suit the occasion, and stated that Germany was fighting with her back to the wall, in a situation for which he could not find an English word to fully express himself---that the word "serious" was not at all adequate as a description of the position in which Germany lay at the present moment. He stated that all Germans were grateful to the Commission for the work they were carrying on, and he would pledge himself to support the Commission in every way; but he could not entertain the proposals which had been made, and begged the Ambassador not to press the point. I stated to him that in pressing this point we were pressing a point which we felt sure was one which gave the Germans a unique opportunity to demonstrate to the world their desire to be fair and generous to the Belgians, and, disregarding all that had happened, the Germans had not turned from the view which they had held from the beginning with regard to Belgium. Mr. Gerard pointed out that the Germans had consistently taken the attitude that they were not conquering Belgium, but had merely entered it as a military necessity, and that it would only be consistent with such an attitude if they did not exercise the rights of conquerors in levying the cost of occupation upon these people. I pointed out it should be the desire of every German to secure the favorable opinion of the United States toward the Germans, and that the first and primary thing necessary to obtain such good opinion was by showing the generous attitude toward Belgium. He stated that American opinion was apparently of little value, as the Americans were supplying arms to the Allies and would probably continue to do so, and that in so doing they were prolonging the war. To this Mr. Gerard replied that the position was akin to two people playing chess, where one, which he might call the Germans, stopped in the middle of the game and asked to have the whole rules of the game altered; that the rules of this game had been set down and practiced by every nation for years, and that if the rules were to be changed it could not be done in the middle of the game. I told His Excellency that there was one other line of action which I thought that the Germans could take with regard to Belgium, which I thought would be most helpful. That it was vital that industry(94) should be re-established in Belgium as far as it was possible, but that before any such industry revival could take place the Belgians must have a greater freedom of movement, and told him that I sincerely hoped that he would reconsider the present attitude toward the better class of Belgians and see if they could find some method by which these better classes could be allowed to move around the country with greater facility, as it was hopeless to get industry reestablished unless this was done. I told him that not only myself but all of my colleagues in the work had been on the most intimate terms with thousands of Belgians and that I could give him my word of honor that neither myself nor they, as far as I could learn, had ever had any suggestions of conspiracy and rebellion since we undertook this work; and that I felt the Germans were perfectly safe in allowing twenty or thirty thousand Belgians of the more important order to have complete freedom of movement within the Occupation Zone. He said, "I wonder if this is really the case"; and stated that he would have the matter looked into and see what could be done. Mr. Gerard again returned to the question of the indemnity and pressed the point vigorously that the Germans could well afford to, and that it was positively in their interest that they should give way. To this the Chancellor said that it is finally, and once for all, absolutely impossible. I then stated to him that no matter what proposals were brought forward, I hoped that he would bear in mind at all times that these proposals would have to be agreeable to the English, otherwise we could not introduce one pound of foodstuff into Belgium; that the English were in no wise convinced that the work we were carrying on was necessary, and that they certainly considered it was not in the interest of the Allies; and that our whole operations hung on a slender thread of sentiment, a large measure of which toward the Belgians existed in England, but that a breath could blow away this sentiment and the Germans would be faced with ten million starving people on their hands. Mr. Gerard pointed out that the same situation existed in Poland(95) and that if they were to obtain the establishment of the same system of food introduction, it would entail the satisfaction of the neutral world with the other belligerents over Belgium. The Chancellor replied that they recognized these points and that they would take them into consideration in the proposals which he hoped they would be able to make; and he stated that the Commission need have no fear but that a solution would be found for other monetary necessities, but that it could not be the solution which the Commission had proposed. I had lunch with Dr. Schacht and Herr Kaufmann of the German Civil Government in Brussels, together with Mr. Heineman. During the course of the lunch I mentioned that I had had a meeting with the Chancellor and that he had stated that a solution would be found by which the Commission would be financed and that I had represented to him that any solution found must be one which took into account the susceptibilities of all of the parties concerned and that he assured me this would be done. Dr. Schacht informed me it was a great mistake on our part to have asked to have the contribution removed, stating that it put us in a bad light. To this I replied that it mattered nothing to us as to the color of the lights when we were performing a just and righteous mission; that I considered, and the whole world would yet consider, that the continued attitude of the Germans toward Belgium was an undoubted blot on their whole national career, and that it was only the lack of imagination that did not lead them to see that an entire change of attitude toward Belgium would produce for them the friendship of the world, now that the English were getting mixed up with neutral shipping in a way which aggravated neutrals. He told me that he was going to have a conference with the principal officials in the Finance Ministry and that they would make out some plan of financing the Commission. I told him that he must understand now that I left it to him to keep his colleagues in line with certain definite principles as to any plans which they had to bring forward; that, in the first instance, they could not put forward any plan which did not take into account the susceptibilities of the Belgians; in the second instance, the plan had to have the approval of the Commission for the Relief in Belgium or they could never carry it into execution; and, in the third instance, the Commission would have to get at least a negative approval of the plan by the Allied Governments or the Commission could not carry on its work. Further, it was wholly useless to formulate plans designed to secure political prestige for Germany alone, and, throughout, any such plans would have to be of absolutely neutral character. Dr. Schacht agreed with this and said that his own view was the adoption of the modification I had suggested the day before: that it should be proposed to the Comité National that the provinces should issue relief bonds; that a general debenture should be superimposed over the top of these collective provincial bonds; that this debenture should be guaranteed unqualifiedly by the Imperial German Government, and that if the Commission could obtain the guarantee of the Belgian Government at the Havre that this would put the whole character of the transaction out of the realm of international friction; that these debentures under these circumstances should be subscribed by the wealthy Belgians abroad; that it ought to be possible to place them in the United States and even England. I told him that if this were adopted it would be necessary for the Comité National and the Commission for Relief in Belgium to make the issue---that the issue could not be made under any government auspices whatever. I told him that I intended to leave for Brussels that night and would therefore be unable to attend the conference with the Minister of Finance on Tuesday. He asked me to remain, as he considered it important that we should have an all-round discussion. I told him that I felt very diffident about discussing anything which concerned the imposing of monetary obligations upon the Belgians; that I had no right to discuss any such projects; and that the only people who could discuss these things were the Belgians themselves; that so long as my Commission was occupied in endeavoring to relieve the Belgians of obligations, I could express myself with freedom and undoubtedly with the approval of all Belgians; but when it came to, imposing further financial obligations upon them, I felt that I would rather the Minister would formulate his proposals and lay them directly before Mr. Francqui. I had a meeting at the Reichsbank at twelve o'clock and there were present Dr. Schacht, Mr. von Lumm, the Chairman and the Vice-Chairman of the Reichsbank, and Mr. Heineman. The meeting was called to consider the financial proposals put forward by the Finance Minister, those put forward by Dr. Schacht and others. I explained that I did not wish it to be understood that I was representing the Belgians in this matter and that as I supposed their proposals would revolve around facilitating the borrowing of money by the Belgians with which to buy foodstuffs, they must bear in mind that primarily this was a matter between themselves and the Belgians; secondarily, however, as they expected to borrow the money from American agencies, I would be glad enough to inform them of such conditions as must necessarily surround any attempt on the part of the Belgians to borrow money in America, either with or without German assistance; that they must bear in mind that the American Government had practically prohibited the making of loans to any of the belligerent governments, and that therefore this loan would have to be neutral. It could only be made neutral by virtue of being guaranteed on both sides. Furthermore, the susceptibilities of the Belgian people and the susceptibilities of the English must be taken into account, as well as the Germans; that no loan could be issued unless there was a firm agreement that the objects of the loan should be solely for the support of the civilian population; that there would be no requisitioning of foodstuffs in Belgium so long as the loan was unpaid; and, on the other side, the English would have to agree to give facilities for the engagement and passage of the ships. The conversation lasted a long time, chiefly in German, and the Chairman of the Reichsbank seemed initially much opposed to the idea; but after infinite discourse they seemed all agreed on the proposals as above laid down, that is, that if the Belgians wished to borrow fifty million dollars in America, the German Government would unqualifiedly guarantee the loan; that the Belgian Government at the Havre should be asked to guarantee the loan; that an agreement should be entered into by which the Germans undertook that there would be no food requisitions in Belgium at any time during the currency of the loan; that the proceeds either in money or food should be entirely for the civilian population, and that the English should undertake to place no obstacles in the moving of ships for this purpose; and they undertook to recommend this procedure at the Cabinet meeting which they were to attend at six o'clock this evening.